Yes, the rumours flying around Windsor are true: there was a close call on the Detroit River today. . . but it may not have been as-close as some recall. 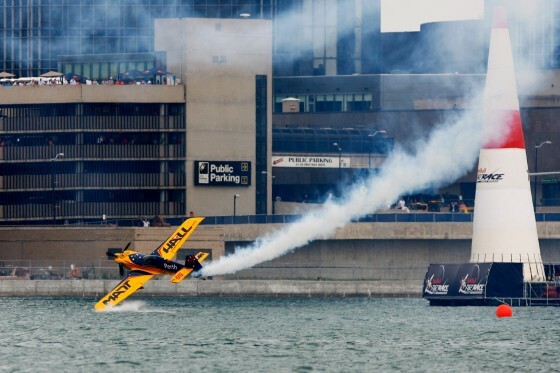 Former US Air Force fighter pilot and national Red Bull pride of Australia, Matt Hall had a very low visit to the Detroit River this afternoon during the first Qualifying session of the Red Bull Air Race right here in Windsor. Hall was pushing the limits of his aircraft, attempting to capture the lead when a turn to the left resulted in what’s known as an “aerodynamic wing stall”. Hall’s left wing touched the surface of the Detroit River, kicking up water as gasps reigned out from crowds on both sides of the border. As Hall regained control of his North Carolina-built MXS-R aircraft, the right wheel of his plane also touched the surface of the water, leading to fears that such a hit would’ve significantly damaged the airplane (and resulted in a possible crash-landing). Hall pulled out of the ‘stall’ and reached a safe altitude where fellow pilot Nigel Lamb gave the aircraft a quite visual inspection. The determination: safe to land. Matt Hall was hoping for a podium finish right here in Windsor, and was eager to get his plane back in the air for the second round of Qualifying this afternoon, but upon landing mechanics discovered damage to the plane significant enough to keep him out of the air for the rest of the weekend. The Red Bull Air Races continue tomorrow!